Toyota’s GT86 TRD will be the first UK model to feature parts from Toyota Racing Development, which is one of the world’s most renowned engineering firms. The GT86 TRD also features new alloys, front and side skirts, rear spoiler and TRD-branded details – which include a branded radiator cap and fuel filler cover, while interior has a TRD gear stick. However, there will only be 250 of these beauties sold in the UK. The GT86 has helped revitalise Toyota’s reputation for building cars centred on the pleasure of driving (after a couple of years with highly publicised recall issues). Now the acclaimed sports coupe – shortlisted for both European and World Car of the Year awards – should win a new army of fans. Toyota’s designers have focused on the sports styling, but without compromising the GT86’s essential performance and handling character. The standard spec on the GT86 includes HID headlamps, front fog lamps, limited slip differential, Smart Entry and Start, dual-zone climate control, drilled aluminium pedals, sports seats, scuff plates, cruise control and Toyota’s ‘Touch’ multimedia system. Acceleration and maximum speed for the GT86 TRD are unchanged at 7.7 seconds for 0-62mph and 140mph for the manual and 8.4 seconds and 130mph for the automatic. Drivers will see combined fuel cycle consumption of 34.9mpg for the manual and 36.2mpg for the automatic. 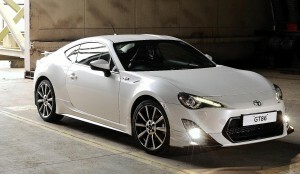 The GT86 TRD goes on sale from 1 March, priced at £31,495 OTR for the GT 86 TRD manual and £32,995 for the automatic. There are just two colours to choose from – Pearl White and GT86 Black. This entry was posted in Car Updates & Releases, Luxury Cars, New Cars, News and Views, Sports Car and tagged caption, car, Car of the Year, climate control, coupe, Cruise Control, Europe, GT, GT86, GT86 TRD, HID, LS, mini, Pearl White, price, seat, speed, Sport, toyota, Toyota GT86, Toyota GT86 TRD, Toyota Racing Development, TRD, UK by Steve Lumley. Bookmark the permalink.